Since taking over Inside Café two and a half years ago, Anna Gebka has grown the small business into a Launceston CBD hotspot. “The original owner had created an amazing space and it was great to add the touches required from being an operator,” Anna says. Anna gained experience in hospitality working at Cube in Tasmania under Manager Bruce Dolle, who Anna says is responsible for making her the successful businesswoman she is today. “He is a one-of-a-kind person and ran a very tight ship. Without working under someone like him, I don’t think I’d be where I am today,” she says. 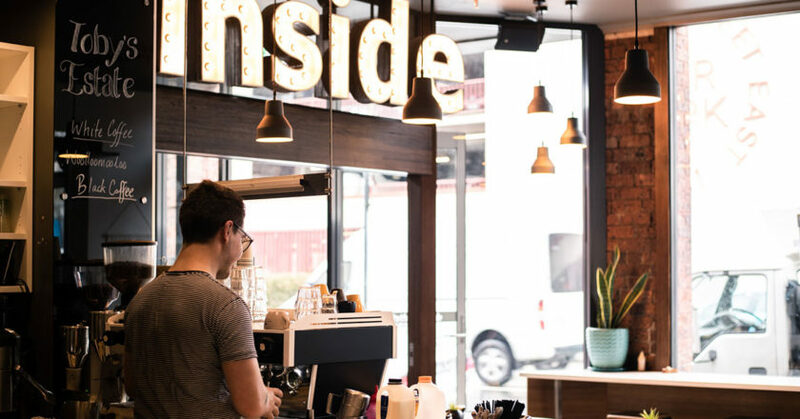 Inside Café serves Toby’s Estate’s Woolloomooloo as its house blend for its body and flavour. The blend contains notes of spice, earth, cocoa, and caramel. Single origins roll every week. Anna works closely with Doppio Foods representative Shane Delanty, who supplies Toby’s Estate in Tasmania. “Shane exceeds as a rep. He could not do more for his customers,” Anna says. To complement its coffee, Inside Café serves a wide range of food across its breakfast and lunch menus. Anna says the truffled mushrooms is a clear standout. “It is oven roasted mushrooms served on a slice of thick cut sourdough with truffle cream, enoki, cherry tomatoes, and poached eggs,” she says. Anna also recommends the eggs Benedict, made with ham hock instead of shaved ham and served with pickled fennel, compressed apple, and cider hollandaise. Anna believes the keys to running a successful café is to maintain quality and develop relationships with customers. Anna says she would like to expand Inside Café – on the inside and out.